So it’s been a little while since my last blog post checking in from our trip, and the reason for that is because we’ve been far too busy having plenty of fun! I left you all in Santa Monica, just as we were about to embark on the road trip leg of our holiday, and somehow here we are, at the end of our first full day in San Francisco. The past five days have been so jam-packed and full of excitement that it already feels like a lifetime ago since we were in LA. One of my favourite things about this trip is that it feels like we’ve been on multiple holidays already, and we still have more time left in San Fran and another two cities to go! The day we left Santa Monica it was actually pretty grey - yep, they sometimes even get bad weather here in beautiful California! We trundled a couple of miles up the coast before stopping in Malibu for some brunch, a place I’d love to explore a bit more in the future - I bet those beaches are just epic in the sunshine. From there, we joined Highway 1 and weaved our way up to Santa Barbara. Even with the clouds the views were stunning, and Sam and I kept nudging each other and pointing out the gorgeous scenery in every direction. We arrived in Santa Barbara at around lunch time, and immediately headed into the town for a little stroll. I’ll be writing more about our stay there, but in short, I fell head over heels for this little beach side city! We ate amazing food, ogled at all of the palm trees and had our first taste of the incredible regional red wine. The next morning we woke up to the familiar Cali blue skies we had come to expect and spent a bit more time exploring Santa Barbara, before getting back in the car and back onto Highway 1. Our stopover for that evening was Morro Bay, but we made sure to visit a few other destinations en route. First was the breathtakingly beautiful Lake Cachuma, which we stumbled upon completely (but happily!) by accident. That’s one thing I’ve learned about the state of California - you’re never more than a few miles away from the most gorgeous scenery. From there we headed to Pismo beach for a walk along the shore, before stopping for a little nosey around in the super cute town of San Luis Obispo. We got to Morro Bay late afternoon, and after checking into our hotel we headed out to explore. It's such a cute little town and one of my favourite places we've visited so far - think cute little surf shacks, chintzy shops and dive bars with epic views. We spent our evening drinking lots of beer, watching the sunset and generally just feeling very lucky to be visiting such a beautiful part of the world. Plus, the next morning we saw sea otters swimming in the wild in the bay, so I think that this will forever be one of my favourite places! After all of the sea otter excitement, we had a big old day of driving ahead of us to get from Morro Bay up to Monterey. Unfortunately part of Highway 1 is still closed following the landslide a little while back, so we took the 101 instead (cue me singing the theme tune to The OC all the way...) and after about 3 hours of driving, we arrived in Carmel. 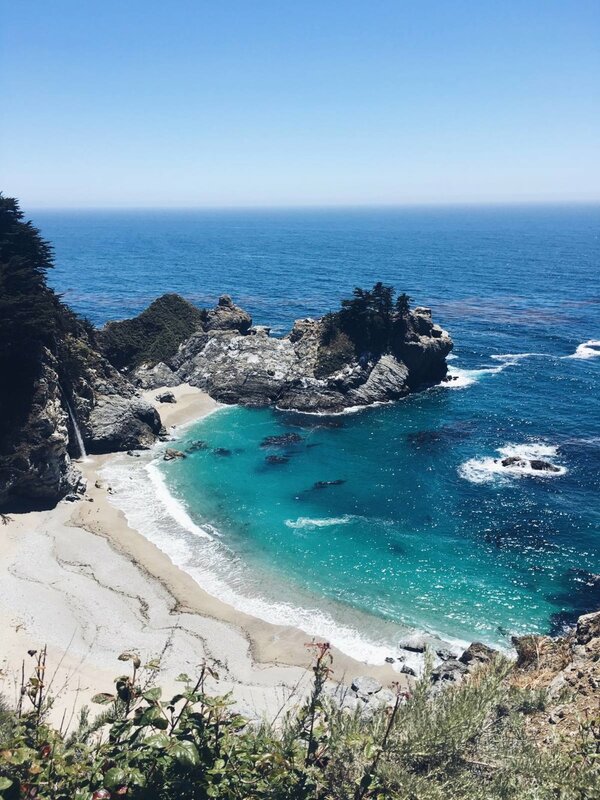 From there, we joined Highway 1 again and headed down to Big Sur and all I can say is WOW. This place has been on my bucket list for years and I had such high hopes, but I wasn't disappointed. The views were so beautiful that I actually cried twice - I just felt so overwhelmed and grateful to be in such a beautiful part of the world with the person I love the most. It was magic. Once we'd taken in all of the beautiful views and hotspots that Big Sur had to offer, we hit the road again and headed to 17 mile drive. This is a private road that you pay a small amount to access, but it takes you along some of the most beautiful beaches that Central California has to offer. We also 3 or 4 deer roaming around in the wild and a herd of seals hanging out on a nearby rock, so it's well worth a visit if you fancy getting up close with the local wildlife. After a very busy but incredible day, we finally arrived in Monterey. Our hotel here was beautiful, and after a quick change and freshen up, we headed down to the water. We wandered along the harbour at golden hour, before heading to Cannery Row for some dinner. From what we saw, Monterey was such a beautiful little town, but we didn't get to see all that much of it, because on Saturday morning we set off early to get to San Francisco, which is where we are now. I'll write about our time here in the city in a separate post, but we're having lots of fun! Writing down everything we've seen and done during the last few days honestly makes me feel like the luckiest girl in the world. I know that I'm very privileged to be able to travel to beautiful and exciting places often, but there is something about this trip that has just felt so special. Everywhere we've been has captured our hearts, and we've been able to do and see things that I've dreamt of for so long. Bring on the rest of the trip - we still have another week to go and I don't want it to end!